The best visible migration recorded so far. A good Spring on a county basis was reflected here and there were some record totals during a varied Autumn period. To further enhance what was a good year, cold weather during the last few days of December, induced some notable southerly passage by Sky Larks and Lapwings. March began typically quiet, with little migration apart from the first odd early movers. Around mid-month, daily passage commenced, mostly Meadow Pipits and Thrushes. April saw continued movements but on a reduced scale and by mid-April, Fieldfare and Redwing were very scarce. The 2 138 Fieldfare recorded in the Spring of 1998, is now beginning to look quite exceptional following similar totals of around 700 from both 1999 and 2000. Meadow Pipit passage was very disappointing, with a generally flat, but constant period of migration and no sign of any real peak. Finch movements were weak apart from a good Linnet passage throughout March and April and a particularly good Spring for Goldfinch movements with some good total counts. Both Siskin and Redpoll were recorded in very low numbers and migratory birds were noted moving over a short period of days. Migratory counts of Hirundines and Warblers were up on both previous years and many species recording their earliest ever arrival dates for the area. A Reed Warbler in the old hedge at Eakring Flash on April 23rd was a first Spring record and there was only one singing Grasshopper Warbler noted, continuing a decline in records since 1998. An excellent series of Wader records, consisted of good numbers of Bar-tailed Godwit, whilst both Oystercatcher and Turnstone were added to the species list. Greenshank was recorded for the first time in Spring, continuing a good series of wader records throughout the period. Rather surprising was an absence of Curlew sightings for the first time. Other common waders were also represented with single Green Sandpiper, two Little Ringed Plover, two Redshank, single Dunlin and Jack Snipe. Osprey (4th record) and Marsh Harrier (2nd record) provided the Raptor highlights, whilst Ring Ouzel appeared for the fourth consecutive year. Regular Hobby sightings and single Peregrine provided the supporting cast, along with at least three local Common Buzzards. Redstart was absent yet again, but three Stonechats and 18 Wheatears (including a female of the Greenland race) were recorded on passage during the period, with Whinchats continuing to remain scarce Spring migrants. The overall highlight of the Spring was the Common Crane seen in March, constituting the second record for the area. One clear feature of this Spring, was the excellent numbers of Hirundines which moved through the area. Sand Martin in particular showed a large increase on totals resulting from 1998 and 1999. A new earliest date was also produced when birds were recorded on March 25th. This was followed by a site record count of 60 moving north-east, two days later on the 27th. Further, almost daily counts were noted until mid- May and a final Spring total of 266 was virtually 200 more than during the corresponding period in 1998. For some reason, House Martin counts acquired to date, have been very low when compared to both other Hirundine species. A highest count of 38 on April 25th, represents a good daily count here and this was another species which produced a new earliest date of April 16th. Swallows produced a final Spring total of 461. This again was more than 200 higher than previous totals. Birds were later than in 1998 and 1999 and a first date of April 9th occurred at a time when birds are usually already back in territory. This fact was, rather surprisingly also noticed by some non-birding local residents who commented at the time. With a first sighting on April 9th, the next, possibly even more interestingly, didn't occur until the 16th and then a good arrival took place at the onset of heavy rain on the evening of the 18th. A constant stream of small groups arrived at Eakring Flash and a total of 53 was reached. Highest Spring count involved 55 moving north May 6th. This came during a particularly noteworthy period of movement from May 5-9th. The fact that this Spring produced such an excellent and varied series of sightings/records can be attributed to the weather throughout most of this period. A prolonged spell of north-easterlies and other easterly biased winds, coupled with often overcast and gloomy conditions produced by an Anti-cyclonic weather system was the primary cause of the best series of Wader records from Eakring Flash to date. This was also the best Spring for waders from a personal observation view since 1994. All wader records came typically during the overcast weather of the early mornings. Conditions also caused most migrant species to fly directly north and there were fewer numbers of birds counted moving west or east than normally. Gloomy and occasionally wet early morning weather often lifted by late morning to give a fine end to the day and as a consequence, some late afternoon movements were noted by Hirundines. April 22-23rd produced what was one of the most interesting migration/arrival periods during the Spring. A large Wheatear arrival occurred on the 22nd, during a morning of heavy rain and overcast conditions. Seven birds were involved (a total that would have accounted for the majority of records in previous Springs) scattered at three locations within the recording area. This satellite picture on the left shows the weather conditions which led to the large arrival of migrants over the Eakring area this Spring. 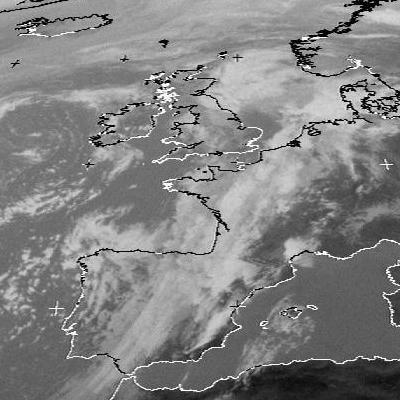 Plenty of cloud over the eastern England on the 22nd, became more extensive as a weather system moved up the north sea (shown left) Excellent conditions for such arrivals were further enhanced by easterly based winds at the same time. Good numbers of Wheatears were also noted in other parts of the county. There were also arrivals of four Whitethroat several Blackcap and Willow Warbler and also a single Whinchat at Eakring Flash. Overnight was clear and the 23rd was sunny with light southerly winds, further Warblers arrived and in record numbers, highlight of which was the area's first Spring Reed Warbler. In addition, there were three new Wheatears also in the area. Certainly, this was an important avain event. As is so often the case, the events/arrivals here, were mirrored elsewhere. It was an exciting Autumn migration period with a combined total of 31,000 birds, resulting from the 29 species most regularly recorded. Species which produced very high total counts were Meadow Pipit (2 700) Fieldfare (5 300) and Starling (7 400) all three species dominating proceedings during September and through to November. With a record daily movement of Swallows, an unsurpassed period of raptor migration and a series of late records involving Summer visitors, the Autumn of 2000 will take some beating. Hirundines produced another spectacular period of movements, not prolonged as during the same period in 1999, but decidedly more concentrated, with two days on which counts of both Swallow and House Martin topped the 500 total. The peak date occurred on September 24th. A most unusual day's migration with several long periods during which noticeable movements by any species remained non-exsistant. Conditions were overcast, but visibility was good and the first Swallows didn't appear until after 9:00am. Soon after, groups of Swallows began continuously passing through the area and totals rose very quickly past the 500 mark by an hour after the first Swallows were recorded. At this point, all movement stopped once again, until a further hour later, when a second wave of birds moved through, taking the total to a new daily record count of 1 167 Swallows. This second wave again lasted for only an hour and was as intense as that of the first period, including many more House Martins (486) and likewise, all movements once again ceased and there was no further passage. Prior to this date, September 23rd, also saw notable counts when 590 House Martins and 657 Swallows moved south. As always, Sand Martins generally showed a much earlier migration tendency. A high Autumn count of 53 on July 17th, was a new record for the period. Return Sand Martin migration during 2000 took place from July 2-September 23rd, though daily movements had ceased by the end of August. It may seem that the seasonal migration of these two families is perhaps overwritten about. The fact remains though, that to anyone recording the visible migration of birds, the seasonal migration by both Meadow Pipit and Yellow Wagtail, makes up a large percentage of the total counts produced during any given Spring or Autumn. Autumn 2000, saw record counts of both the previously mentioned species, a series of very late Tree Pipit records alongside some late and notable Yellow Wagtail dates and a record movement of Pied Wagtails. Most of this occurred during the last week of September and the first day of October. Total counts of Meadow Pipits were in excess of 2 700 birds. This total is by far and above any other such count achieved to date previously. An average total, based on the years 1998/1999 would be around 1 300, so it is very easy to see the importance of this Autumn's Meadow Pipit passage. The most unusual feature was the regular three figure counts. These occurred on most days when conditions were favourable and to some extent, when such counts seemed most unlikely. The two peak dates were September 27th and 29th, both days producing counts of 500+. Other notable dates were 209 south, September 17th, 109 south, 24th, 152 south and south-east, 25th, 152 south, 28th, 210 south on the 30th and 327 south, October 1st. Linked with these Meadow Pipit movements were an unusual series of very late Tree Pipit records on September 27th, 28th and October 1st. The previous latest ever date for the species here was September 20th, 1998 and certainly, Autumn Tree Pipit records are relatively common from August 13-September 12th, with a pronounced peak around August 16th. The late date of these records is therefore substantial. With six birds involved in these records, it seems likely that the origin of these particular individuals is Scandinavian. Record numbers of Wagtails (including a new latest ever date for Yellow Wagtail) were also produced during the same, late September spell of migration which had also seen the high numbers of pipits previously mentioned. Migrant Yellow Wagtails were noted from July 5-September 28th, peaks occurring on September 10th with 23 moving south and 16 moving south, September 17th. Both of these represent late dates for peak counts, which typically occur around mid-late August. An overall total of 136 birds was also way above the Autumn 1999 total of 93. Pied Wagtails have produced few daily Autumn totals higher than 20 since 1998, so the 76 Pied Wagtails moving south on September 29th, may well remain a long-standing record for several years. Now extremely well documented in the birding press and elsewhere, this Autumn will remain unsurpassed for many years, if indeed ever, for the record Honey Buzzard influx which occurred pretty much throughout the country between September 20-October 1st. Perhaps the most surprising thing was that the Eakring and Kersall area only got in on the act with just one record of a single moving south on September 23rd. With the greatest amount of observer coverage limited primarily to the mornings, perhaps this record becomes slightly less surprising , though the area did score more than many inland sites, with a variety of species akin to places with a much larger water area than that found here. Two Marsh Harriers, Osprey, Red Kite, four Peregrines, several Common Buzzards and numerous Hobbies, all helped to produce an exciting beginning to the Autumn migration season. A female Marsh Harrier on August 8th, started off the proceedings, spending the best part of an hour quartering the Bean field near Eakring Flash, before eventually drifting off south-west. This was the first Autumn record of Marsh Harrier here, following on from the individual earlier in the year. Second of the larger Raptor was the Red Kite on September 2nd. Present for several hours mid-morning around Hare Hill Wood near Kersall. The bird (an immature) found it's way onto two other county lists, before drifting off north. Both of these records, occurred prior to the raptor influx of September 20th and it wasn't until the 23rd, that the first evidence of the influx hit the area. This day saw the previously mentioned Honey Buzzard moving south over Red Hill, but also the first record of four Common Buzzards in the area at any one time. Detecting migrant Common Buzzards here is difficult, primarily due to mostly juvenile/immature birds moving into the area from late July onwards. An afternoon visit on this day, saw a build-up of birds over Lound Wood, all coming in from the north-east. Even allowing for the two regulars, at least two were thought to be migrants. As the afternoon progressed, two of the birds moved of south-west and south-east. The morning of the 27th, again saw a similar picture. Four birds over Lound Wood, this time during the morning, with two again heading off south-west. On the 30th, a single flew through, representing the sixth migrant Common Buzzard of the Autumn (this record following on from another single bird on the 4th) Now well into the raptor influx, September 24th saw records of both Marsh Harrier flying low south over Red Hill early morning, and an Osprey through Eakring Flash later the same day. Reports of Hobby during this period were widespread throughout the county. The Eakring area provided numerous records, many of which were attributable to an adult and an immature which spent several days in the Eakring Meadows area and indeed, setting a new latest record for Hobby here. This lengthy stay was unusual and more likely to have originated from successful breeding nearby. Both birds had been present well before the influx. Hobbies were recorded in the area on 15 dates throughout August and September. Peregrines were first noted on September 10th, with further records of different aged/sexed birds on September 25-27th, October 14th and 22nd. An Autumn total of four birds being exceptional for the area.